The bill will strengthen obligations placed upon animal keepers and owners in terms of food, housing and general care rather than outlaw the use of animals in circuses. THE NEW ANIMAL Health and Welfare Bill will strengthen obligations placed upon animal keepers and owners in terms of food, housing and general care – but will not place a ban on animals performing in circuses, Minister Simon Coveney has confirmed. The Minister for Agriculture, Food and the Marine, who has brought the bill forward, said it will include welfare issues relating to animals in circuses – which until now has been covered by the Protection of Animals Acts 1911 and 1965. While the new legislation will see greater responsibilities placed on those caring for animals it will not extend to banning the practise of including animals in circus performances, Coveney confirmed in response to a Parliamentary Question on the matter. Robert Dowds TD had requested Coveney to make statement on “his plans to amend the law to make it illegal for circuses to hold performing animals in captivity and use them as part of their performance”. With regard to animals performing in circuses, I do not intend to interfere with legitimate recreational and sporting events, including the use of animals in circuses, provided they are carried out in a proper manner and no unnecessary suffering of the animals is involved. 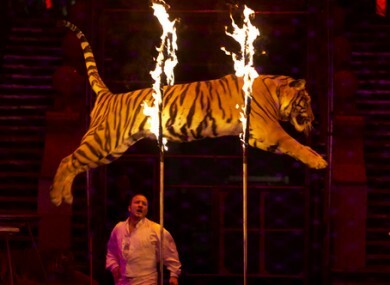 Email “New welfare bill will not ban animals performing in circuses - Coveney ”. Feedback on “New welfare bill will not ban animals performing in circuses - Coveney ”.